By 2020, the US economy is expected to create 55 million job openings: 24 million of these will be entirely new positions. And 48 percent of the new jobs, according to Georgetown’s Center on Education and the Workforce, will emphasize a mix of hard and soft intellectual skills, like active listening, leadership, communication, analytics, and administration competencies. How can companies get a better idea of which skills employees and job candidates have? While university degrees and grades have done that job for a long time, they’ve done it imperfectly. In today’s rapidly evolving knowledge economy, badges, nanodegrees, and certificates have aimed to bridge the gap – but also leave a lot to be desired. While HR departments are eager for better “people analytics,” that concept is still fuzzy. And simply collecting data is not enough – to be used, data has to be presented usefully. One potential model is GitHub. GitHub is a social networking site for web developers to collaborate on open-source code management. It’s a way for developers to display their revisions of public repositories of code. Anyone in tech will recognize this grid as a GitHub profile. The darker the green, the more a person has contributed to the platform. Imagine having a profile like this for other competencies. An employer could immediately see the depth of a candidate’s profile in different areas—both her foundational skills as well as her other technical skillsets. What if we could click on that darker colored square in the grid and immediately view artifacts from the candidate’s past experiences that best illustrate that competency? Or, in other cases, we might see that a company or institution validated that particular competency. A profile of competencies with the visual impact of a GitHub profile would make immediately clear to employers a candidate’s capacity and potential. At the same time, each person would similarly be able to identify his or her own skills gaps that need to be filled. Competency grids demonstrate precisely what people can do: This person can apply financial principles to solve business problems; this person can write memos by synthesizing data from multiple sources; or this person can evaluate web resources. As more and more knowledge work ends up online and in the cloud, creating GitHub-type profiles for a broader range of activities becomes increasingly feasible and automatable. GitHub uses a yearlong period over the x-axis to view easily how often over the course of the week (y-axis) a person has contributed to the platform. In the example below, “Alex” made more sustained and continuous streaks of contributions to the platform, but we can see that “Dana” made a concerted effort—probably the vast majority of 104 contributions—in the first week of March. Imagine, however, having a multiple-year horizon on the x-axis and competencies/skillsets listed on the y-axis. We might see skills such as strong writing and editing, public speaking, planning and organizing, time management, technology skills, problem-solving, critical thinking, reasoning, negotiating, and decision-making, adaptability, professionalism and customer focus. Technical skills could be viewed and validated alongside the “softer” skills that so many companies are looking for. Last year, Burning Glass Technologies actually created a grid of competencies not unlike a GitHub profile. The authors of “The Human Factor: The Hard Time Employers Have Finding Soft Skills” crawled through data from millions of job postings and built a grid, identifying the soaring demand by employers for what they call “baseline” skills. 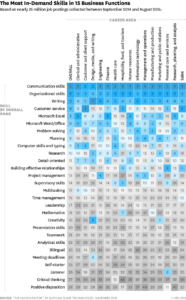 They ranked the foundational skills by career area, and used heat-mapping to illustrate the most valued or most commonly requested skill in each area. These baselines skills tended to cluster into six main competencies: (1) Presentation and persuasion; (2) Customer service; (3) Attention to detail and time management; (4) Positive disposition; (5) Project management, research, and strategy; and (6) Supervisory skills. Using a grid like this, employers and managers could access a candidate or employee’s profile and either get a more granular, complete view, or could zero in on the most important skillsets and competencies to them. The grid could toggle accordingly to show the depth and arrangement of the person’s experience and growth over time. Employers could be able to scan quickly and see the strengthening and deepening of a person’s abilities. Ideally, this would also be a social network and e-portfolio, allowing an employer to see samples of work and trust that the skills presented had been validated by others (The social component of GitHub is important to underscore because other developers validate and consume another developer’s work. This contrasts starkly with the “skills”—if we can call them that—that users can tag so quickly on LinkedIn, such as “higher education” or even “ninja”). A tool like this could have an impact far beyond hiring better candidates or getting a clearer picture of an employee’s skills. It could even lay the groundwork for a marketplace that didn’t have to depend so heavily on college degrees as proxies for talent. After all, most employers use the degree as a screen or general sorting mechanism that may not relate to the jobs’ duties. That imprecision has led to the demand for higher and more degrees for jobs that don’t really require a degree in the first place. Better people analytics – and better ways of visualizing and interacting with that data – will not only help managers and recruiters do a better job of matching people with jobs but will also help each of us develop a more accurate picture of our strengths and weaknesses. We’ll be able to send clearer signals to the market about all that we can do. Michelle Weise, Ph.D. is the Executive Director of Sandbox ColLABorative, the research and development lab of strategy and innovation at Southern New Hampshire University. She is also the co-author with Clayton Christensen of Hire Education: Mastery, Modularization, and the Workforce Revolution.